Friday was ANZAC day. As usual, DH and I went to the local dawn service, so I was a little tired in photos! I dressed warmly with a singlet under this top and a colourful hoodie over it. It allowed me to take off more layers as the day heated up. Ended up just wearing the singlet for most of the day. Going to the dawn service each year is our family tradition, it's interesting to think that this time next year we will be there with baby. It's good to take a moment to respect and remember the bravery and courage of those who served and are still serving in our defence forces. 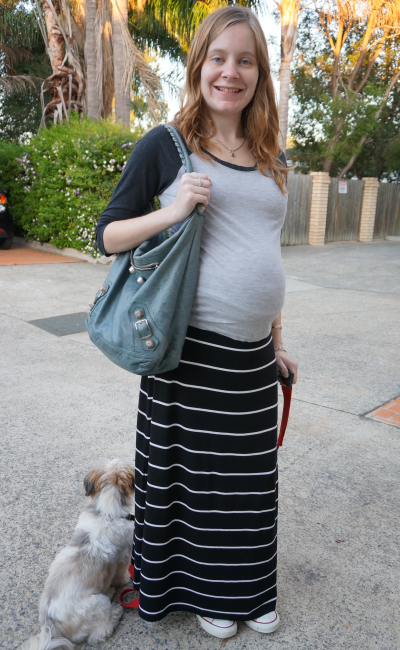 Last worn: baseball tee, striped maxi skirt, white converse, Balenciaga tempete day bag. Casual Saturday outfit. We had to take Cooper to the vet today for his vaccinations, poor little guy. He was not happy to be in the examination room, but he got lots of attention afterwards, and of course some treats too. I've had this ninja baby tee for a while. My sister gave it to me as a Christmas gift, and made sure it was a size larger than normal so I could wear it the entire pregnancy. Like I do with most items in my wardrobe, I'd been saving it for the "perfect occasion". Came across it last night and realised that I only have 6 weeks left to go, I should really be wearing and enjoying it more often instead of saving it. Got lots of comments and giggles on it today, it's so fun! :) Was glad I wore it. Might have to wear it to one of our antenatal classes too, that would be a good occasion. 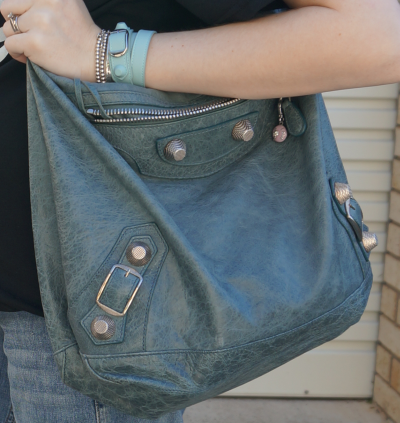 Last worn: maternity denim shorts, Havaianas, Balenciaga day bag (see above). First time I've worn the tee. Love the baby ninja tee...too funny! Your sister is a great gifter..
Hahaha, that tee is amazing! I love it =) Your cool ninja baby! The dawn service is a memorial service at dawn for the ANZAC soldiers. We have lots of services and parades over the day for people to pay their respects at different times, but it has become a tradition for us to attend the dawn service. I really like the first outfit and how you wore the maxi skirt. I will need to give this look a try. And I agree to not save something for a special occasion. Enjoy it! yes, I have too many things "saved", I need to wear what I own more! Omgsh, that ninja baby tee had me in giggle fits! xD I freaking love it! and i bet you got some smiles out of strangers with that cool t shirt. What a cute shirt! I've seen similar ones, but never a ninja baby! And I bet at this point, it really feels like the baby is doing crazy kicks! Yep, baby is kicking and punching away! The ninja baby tee is too adorable! I love it! The Ninja Baby tee is amazing! So great! that shirt is so cute! i should have totally gotten one for my sister for the three times she's been preggers! You look absolutely gorgeous with your baby bump, I love the first outfit to bits! The baby ninja is so cool too! Great look, love the dog! I love a good pair of Converse! And that shirt is hysterical. You look adorable as usual. Hope you have had a good weekend! Ah, thank you for posting the baseball tee! I have been wanting one but I don't want to spend much on it. This F21 might be just what I need! Cute outfits, and hope you stay comfortable these last 6 weeks! That ninja baby tee has me cracking up, I love it! That ninja top! Love it! I've never been to a dawn service yet though I can imagine how powerful it must be to attend one. Next year will be a special Anzac Day for you guys! Next year will be special with baby in tow! :) I think all of the services on ANZAC day are good, no matter what time they are at. 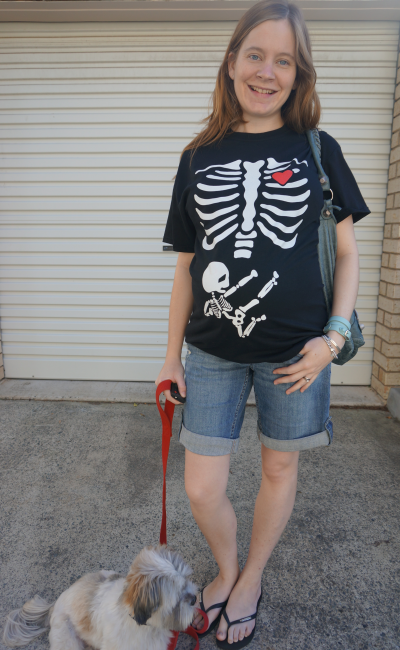 that skeleton tee is so dang cute! You look adorable in both look, and such a cute T-shirt. Love your Balenciaga! 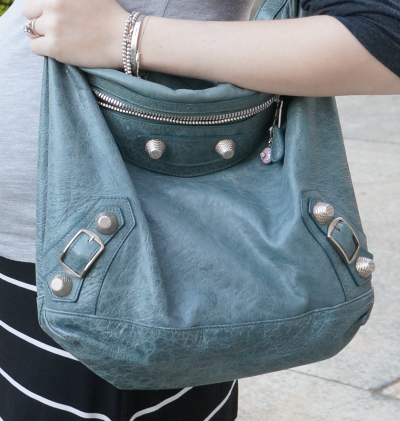 Wearing my purple city over on my blog tomorrow... Would love for you to check it out! Your sister is too funny! HAHAHA That's the best shirt. Looks great on you! Oh, when baby get's here its going to be ultra fabulous. All the things you'll do! Such a beautiful family.